Facebook wants to tell the world that it is really serious about your safety as it strives to create an online environment where everyone can connect with anybody, share updates and stuff without getting bothered by possible phising, malware and privacy attacks. To reiterate its vow in protecting user privacy, Facebook just launched a completely redesigned Safety Center. 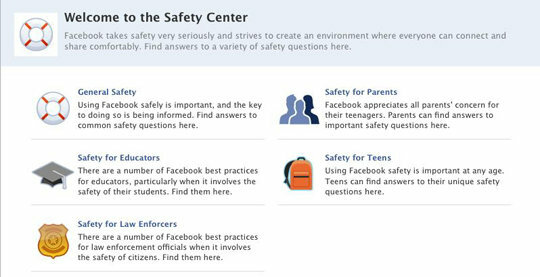 The Facebook Safety Center offers new safety resources for parents, educators, teens and members of the law enforcement community. Facebook has also created a cleaner and more navigable interfaces that would help you find answers to questions relating to your safety as you use Facebook. It also contains multimedia contents culled from Facebook itself as well as from independent organizations which specializes in online safety and security. You can find safety-related content organized by audience type and by topics including “Addressing Personal Safety” and “Responding to Objectionable Content.” If you’re a parent you can easily find the “Safety for Parents” section where you’ll get advice from Facebook’s partners such as the Safety Advisory Board. The Facebook Safety Advisory Board includes members such as the Childnet International, Common Sense Media, Connect Safely, The Family Online Safety Institute and WiredSafety.